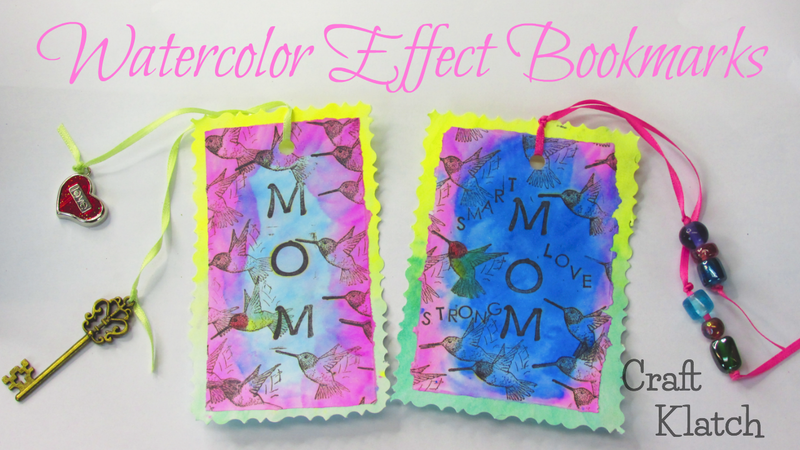 With Mother's Day coming up, you might need a last minute gift and this watercolor effect bookmark is easy, inexpensive and uses Sharpies! It's a great scrapbooking technique too! The links below help support this channel, as I may earn a small commission at no extra cost to you. 1. Take a piece of multi-purpose paper (regular copy paper) and stamp out MOM. 2. With little stamps, stamp words that describe your mom. 3. I used a hummingbird stamp, but you can use anything that you think your mom would like (flowers, ladybugs, wine, etc.). Stamp that image all around Mom, but try not to overlap it. 4. Now carefully rip out mom. You want the edges to look rough. 5. Take colored pencils and color one hummingbird in, just to make it stand out. 6. Using makeup sponges that I used from the dollar store, I scribbled on them with Sharpie markers and added a little rubbing alcohol. 7. Then, swipe the sponges over your paper. I did blue in the center and pink on the outside. I also did a paler version and a bolder version. You can make whichever you like better. 8. Now rip a piece of card stock, a little bit larger than your stamped piece. 9. Stamp the backside with your hummingbird stamp. 10. Color in one hummingbird. 11. Repeat the Sharpie and rubbing alcohol technique on the front and back on this paper. I used a green and a yellow, so they would not blend with the other paper. The paper dries very quickly, so there is very little wait time. 12. Use a glue stick and apply glue to the back of the mom sheet. Make sure you get it everywhere! 13. Center it on the card stock and rub down. 14. If you want a cleaner edge to the bookmark, you can use a decorative scissor to give you that look. 15. Punch a hole into the top of the bookmark, with a hole punch. Don't put it too close to the edge because the ribbon might rip out over time. 16. Add a ribbon and some beads, or charms and you are done! It's a great craft to get the kids involved to make Mother's Day gifts! Thanks for stopping by! Remember: Life's too short not to shimmer, so grab your glue gun and your glitter!™ Stay safe! I always love to hear what you are thinking! I read each and every comment. Thank you for taking the time and stopping by! 56 Beachy Crafts and DIYs! ***This blog uses affiliate links, including Amazon Affiliate Links. Copyright Craft Klatch LLC 2011-2017. Powered by Blogger.